Keep your business moving forward with Sharp�s newly designed AR-M455N Digital Imager� workgroup MFPs. With powerful multitasking capabilities, the 45 page per minute document system will save you valuable time and dramatically increase office productivity. With advanced copy, print, scan, and fax functionality, you will spend less time at the office copier and more time on your business at hand. 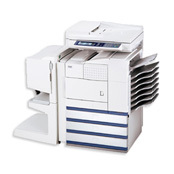 Additionally, the AR-M455N Imagers utilize a scalable design, which enables them to offer versatile document handling and finishing features, integrated software solutions, and built-in flexibility to make it easy for businesses to adopt a secure workflow that meets the needs of today and tomorrow. For sale in New York City only. Advanced 50-sheet Duplexing Single Pass Document Feeder (DSPF) with Scan Technology scans both sides of a document in a single, straight pass. This feature improves efficiency, reduces scanning time, and helps maintain the integrity of your original documents. Powerful 300 MHz true multitasking engine controller enhances multifunction capabilities for Copy, Print, Scan, and Fax operations. Standard 40 GB hard disk drive offers heightened speed and processing power. Standard tandem copy/print capability saves time and distribution costs when two AR-M455N Imagers are deployed on the same network. ImageSEND network scanning enables sharing of documents across and outside the network, allowing for a fast, efficient, digital workflow. Sharp�s innovative Scan Technology increases productivity, enhances reliability and preserves document integrity with high-speed scanning of both sides of an original in a single pass. Scanned documents can be sent directly from IMAGER control panel to six different destinations: Send to Desktop, Send to E-mail, Send to FTP, Send to Group, Send to fax and Send to URL. Standard Document Filing provides security and convenient access to frequently used documents such as forms and templates; with up to 20,000 pages of storage capacity everyone on the network can share and access documents. Gain quick access to corporate addresses with Lightweight Directory Access Protocol (LDAP), which automatically searches and displays a list of matching names from the first, few characters of the address. Versatile Unique File naming function lets users enter specific file names with customized messages and subject fields for easy recognition and archiving. Application Integration Module allows users to enter Index fields at the MFP, and send it as an XML file along with your scanned documents, therefore automating tasks that once took several steps. Instantly fax documents directly from the desktop with lightening-fast Super G3 Fax Expansion Kit and innovative PC-fax driver. Other time-saving fax features with the Super G3 Fax Expansion Kit (and Network Scanning Expansion Kit) include Internet fax capability, single-pass duplex transmission, simultaneous fax transmission, and sequential broadcasting up to 500 destinations. Easily integrate scanned documents into everyday workflow with flexible, intuitive Sharpdesk� Desktop Document Management software. User-friendly tools enable the organizing, editing and even combining of scanned documents for maximum productivity. The Full Text Search feature allows for fast retrieval of archived documents. Compatible with Liberty IMS, an enterprise-level solution enabling users to quickly capture organize and retrieve documents. With structured indexing and full-text search capabilities, Doc2NET delivers quick and convenient access to shared documents for the entire workgroup. Automatic forms management and distribution with available Reform Enterprise by FabSoft. Several layers of network, device, and data security protect your greatest asset: your information. Confidential Print feature requires users to enter a 5-digit PIN code to release and print documents. User access on the network can be verified before any scan operation is performed with User Authentication. Restrict network access to the IMAGER with MAC/IP Filtering and Port Management. Optional Data Security Kit provides enhanced security by protecting data in the IMAGER�s memory with AES 128-bit encryption. Overwrite feature can safely clear memory by overwriting encrypted data up to 7 times. Scalable security offerings designed to help offices meet regulatory requirements, such as the Health Insurance Portability and Accountability Act (HIPAA) and the Gramm Leach Bliley Act (GLB). Administration Utility Suite provides a collection of easy-to-use software that simplifies installation, monitoring and use. Print Status Monitor lets network users view printer conditions, including paper levels, toner and more. IT managers can easily install and configure printers on the network and monitor networked SNMP-compliant printers by using the Printer Administration Utility. Remote E-Mail Diagnostics automatically alerts IT managers, key operators and authorized Sharp dealers with information about the IMAGER�s status. User and administrator-level access have advanced web-based management capabilities with the IMAGER Home Page. Standard print/copy accounting controls include Print/Copy Auditor for tracking usage by user ID number, also supports Equitrac�s PrintLog Accounting Server and SharpAccountant which enables you to track and monitor your IMAGER�s activity by account code, device and function.